Navigate to the 'EDIT PAGES' screen for your App (see the 'Navigation Path' at the top left of the image above). Locate the relevant 'Booking Form' from the page-list. The 'Booking Form' is a 'Feedback' page type. The icon for the 'Feedback' page type is indicated by a green square with a white arrow pointing downwards. Click 'Edit' (as shown above) to open the page for editing. The image above has been split up into different sections (colored boxes) to assist understanding. Each 'box' is described below. Red Box: The red box contains five (5) fields, three (3) check-boxes and the option to slide the 'Booking Form' page to another page. Header Image (field): Select your preferred header image as required. The image used on this page is normally your Club's logo. For further information on uploading images into your App, go to How to Add a File to Your App's 'Resources'. Target Email (field): Enter the destination email address that you wish bookings to be sent to (e.g. bookings@golfclub.com). Email Subject Text (field): Enter the text for the 'Subject' line (title) of booking emails. The preferred email subject text will be automatically populated on the booking email (e.g. Tee Time Booking). Edit this text as preferred. Submit Button Text (field): This field displays the text shown at the bottom of the 'Booking Form'. This text is effectively a button that submits the booking email to your Club. Edit the text for the 'Submit Button' if required, or leave unchanged. Confirmation Message (field): The 'Confirmation Message' is automatically displayed on the App-user's device (pop-up image) after tapping the 'Submit Button' (described above). Edit this field as required. Clubs should ensure they confirm each booking via a separate reply email, SMS message or telephone as preferred. Show Location Picker (check-box): Leave this box un-checked. This function is not applicable for the 'Booking Form'. Enable Data Autofill (check-box): Checking this box allows data to be auto-filled when completing the 'Booking Form'. Note that not all devices support this function. Submit Button Only Saves Data (check-box): Leave this box un-checked. Checking this box will disable the auto-email function in the 'Booking Form'. Slide to Next Page: Leave this setting unchanged, unless you wish to allow the App-user to slide from the 'Booking Form' to another page in your App. Enabling this feature is not recommended as users should be encouraged to 'Submit' their booking before navigating away from the 'Booking Form'. Orange Box: 'Field Items' section. Each 'Field Item' represents a field on the 'Booking Form' (e.g. Cart Options as shown in Step 3 below). Add, delete or change the order of the 'Field Items' on the booking form by using the (+), (-) or arrow buttons (located beneath the 'Field Items' section). Green Box: The 'Item Properties' section contains the 'Type', 'Label' and 'Required' settings. Each setting is described below. Type: The 'Type' property defines the function of the selected 'Field Item'. Field item types include date, time, text, multi-line text, email, image, camera, list, multi-list and 'save option'. The 'Save Option' is described further in Step 5 below. The function of the 'Field Item' is selected via the drop-down menu. Some field types include sub-menus which enable additional editing features. For example, you can define how many options appear in a list (e.g. the number of golf carts required for the booking - none, one or two etc. as shown in Step 3 below). 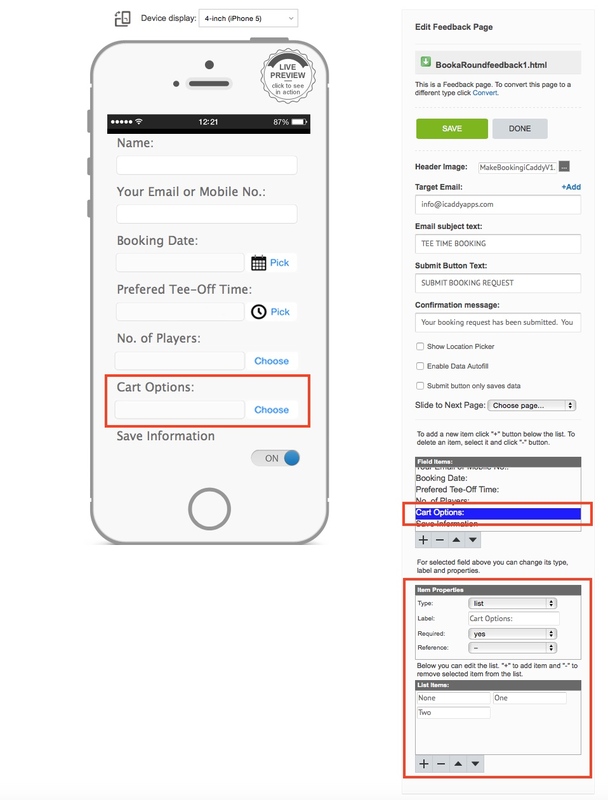 Note that most field types are not used in the default 'Booking Forms' provided in iCaddy App templates. Label: The 'Label' property reflects the text displayed for the corresponding 'Field Item' on the device (e.g. 'Name:'). Required: Select 'Yes' or 'No' for the respective 'Field Item'. Selecting 'Yes' requires the App-user to complete the corresponding field on their device in order to 'Submit' the 'Booking Request' (i.e. the corresponding 'Field Item' becomes mandatory). If a mandatory field is left blank, the user is requested to complete the relevant field(s) before submitting the form. We recommend setting 'Yes' for all 'Field Items'. In the example shown above, 'Cart Options' is selected from the 'Field Items' section. Note that the 'Cart Options' field has 'list' set for the 'Item Properties' Type. These type of fields display a 'List Items' sub-menu (bottom-right of screen). The sub-menu allows the Club to define the number and description of 'List Items' for the chosen field (e.g None, One or Two). 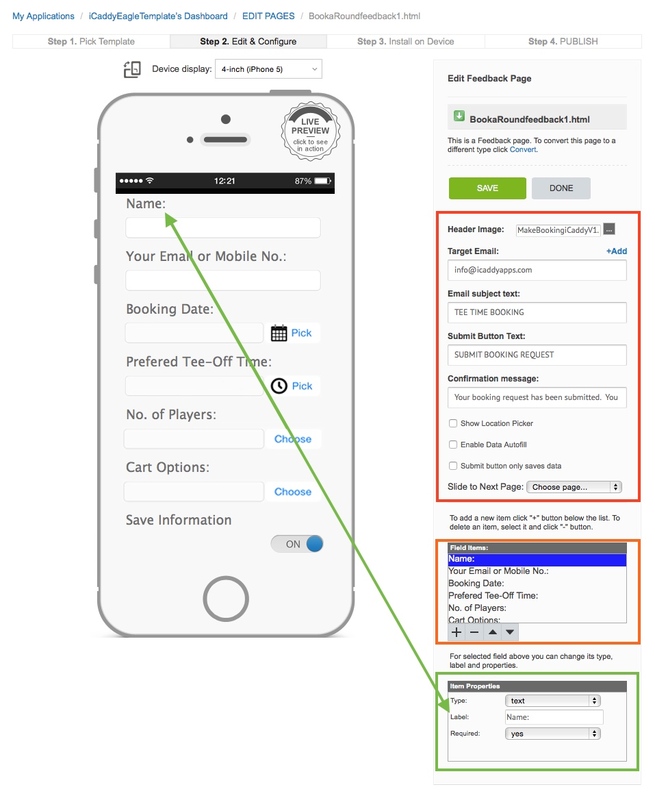 In the example shown above, the App-user can choose from 'None', 'One' or 'Two' golf carts when making the booking. 'List Items' can be added or deleted using the (+) or (-) buttons located beneath the 'List Items' sub-menu. 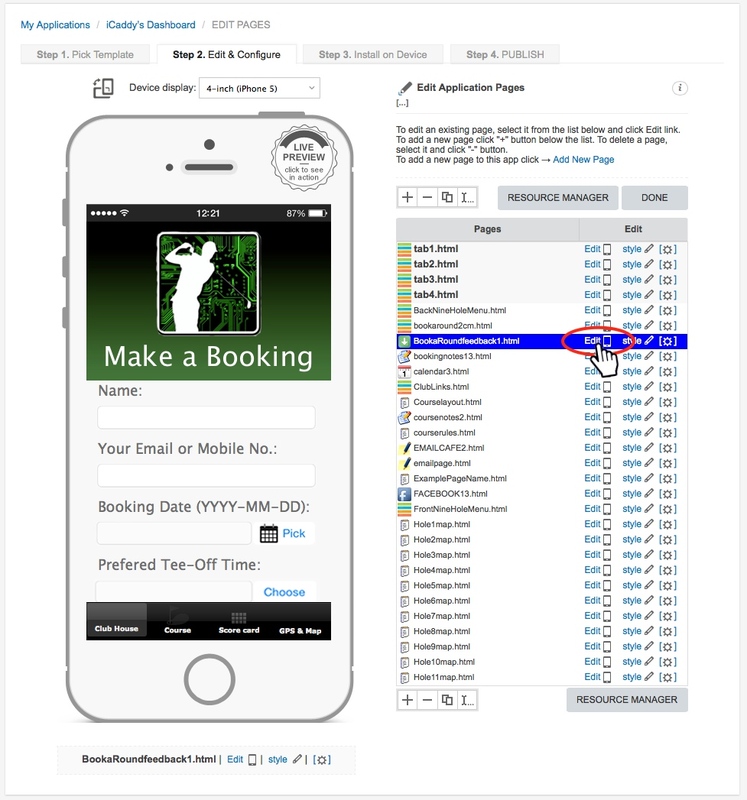 The 'Booking Date' Field Item allows the App-user to select a date from an in-built calendar. Club's should ensure they are aware of the default 'date format' set (e.g. YYYY-MM-DD) when receiving bookings. 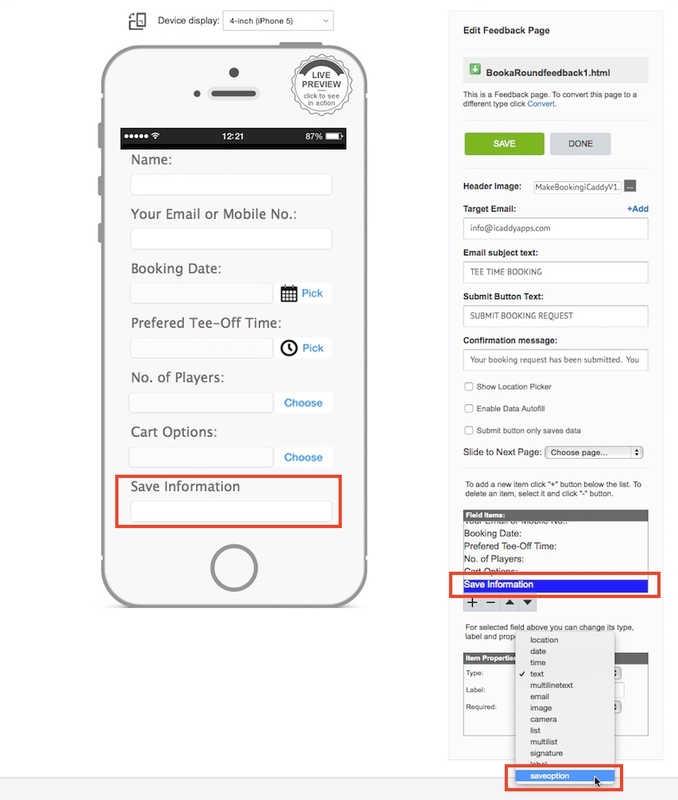 Save Information Function: This great feature allows the App-user to automatically save the information entered in the 'Booking Form' fields on their device. When editing the 'Booking Form', this feature must be set last in order for the setting to apply to all edited 'Field Items'. After completing all previous editing requirements, select the 'Save Information' field item, then select 'saveoption' from the list of properties (as shown above). Select 'yes' from the drop-down list for the 'Required' field. Click 'SAVE' then click 'DONE'. Check that the 'Save Information' feature appears at the bottom of the handset display (as shown above). 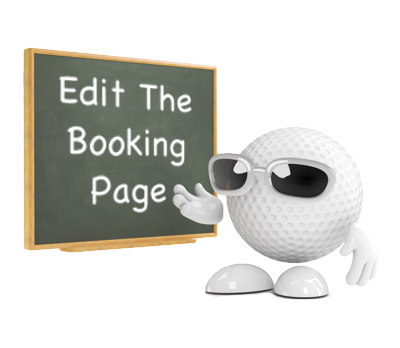 Note that if any subsequent edits are made to any 'Field Items' on the 'Booking Form' page, Step 5 must be repeated to enable the 'auto-save' feature. 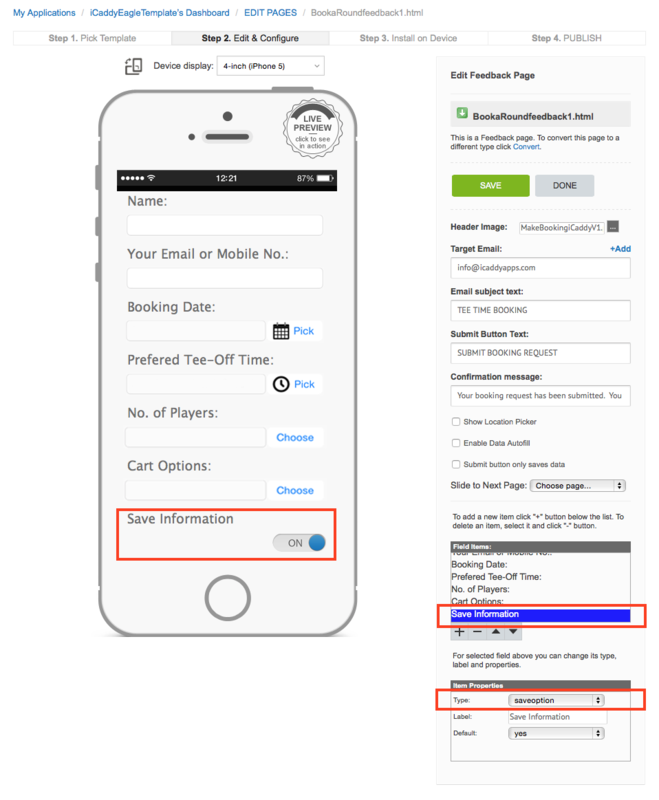 Note: The default 'Booking Form' provided in all iCaddy App templates includes the fields necessary to facilitate successful e-bookings for your Club - minimum customization is required. 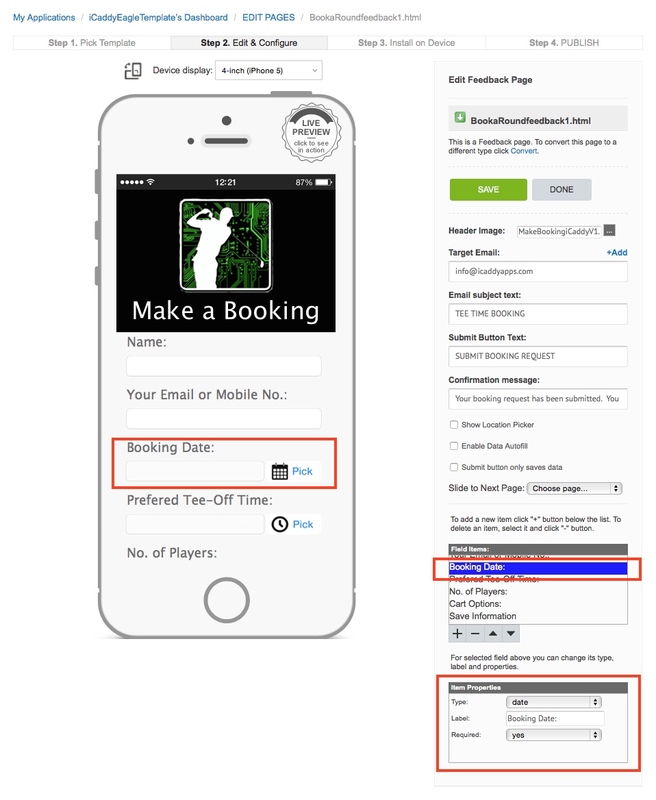 Setting-up a 'Booking Form' is as simple as changing the background image (optional), inserting your Club's logo in the Header Image (optional), entering a destination email address (mandatory) and setting the auto-fill feature (last). If preferred, all 'Field Items' and their functions can be customized to suit your Club. After making the necessary changes to customize the 'Booking Form' for your Club. Use the 'iCaddy Apps Previewer' App to view edits made to the 'Booking Form'. For further information on using the Previewer, go to How to Download the iCaddy Apps Previewer.